Six months have passed since we started this blog. Although many travel guides have been published in other sites (forum, wiki, event pages…), this blog has provided us a more stable place for find these travel guides. This post is for announcing two improvements in the blog and one recognition to hard working. But there are older travel guides and they should be available for everyone who wants to have it for a later trip to those cities. After some suggestions and some discussions inside the team, we have decided to create the Archive for all travel guides. The Archive section is in the Menu taskbar. At the moment there are two folders: 2010 to 2014 and 2015. And we will have more in the next years! In these folders, you can find all the available travel guides. Use them! Sometimes you go to a city and want to know if there is a city with a travel guide. No problem. 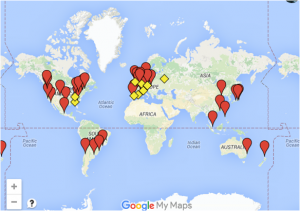 We have prepared a map in which you can find all travel guides available. Creating a travel guide consumes a lot of time. It is not easy: you have to navigate on internet looking for information, phone to the hotels, call the Tournament Organizer, write the text, search images, and prepare guided tours… all of you that have worked in one know what we are talking about. The final results may be more professional or more personal, with mountains of information or just the essential; but all of them have a lot of work behind. Thanks to the authors of these travel guides because your work have made the trips for a lot of judges and players easier and more enjoyable.